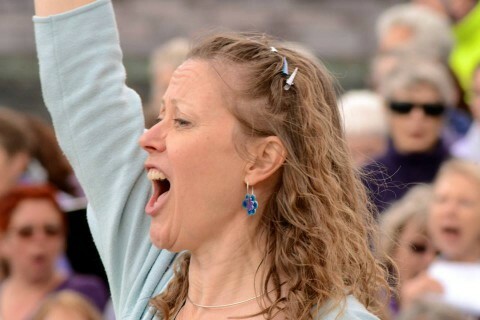 Committed and experienced natural voice practitioner, Celia has been leading all sorts of voice and singing groups for 20-odd years. She brings a blend of relaxation, focus, depth and lightheartedness to her work. After spending years forcing her friends to learn harmonies round the dinner table (before feeding them), she began to get requests to create ‘Instant Choirs’ out of unsuspecting conference or party guests. She has encountered and trained with many highly regarded voice and performance experts, including Enrique Pardo, Frankie Armstrong, Kristin Linklater, Phillip Zarilli, Song of the Goat and Gardzienice Theatres, as well as many traditional singers from Brittany, Sweden and Wales and of course the wonderful comrades of the Natural Voice Community. She is running two permanent, open, inclusive Natural Voice community singing groups with more on the way. Some of her ‘Local Vocals’ singers are original members, still coming after 20 years! She also runs all sorts of one-off workshops such as ‘Singing for the Terrified’ Seasonal Wassails, Caroling and ‘Wild Singing’; ‘Age Positive Singing for Well-being’, Natural Voice Sessions for established choirs, Voice technique for theatre and performance including circus; and as the ‘Voice Ninja’ with ground-breaking ‘InspireMe’ company she offers highly effective corporate team-building and voice care with business and charity professionals. In 2014 she began leading singing holidays and teaching regularly abroad in Bavaria and with the superb ‘Maison Anglaise’ in Morocco (Click here for 2019 details!). 2018 saw the start of a new adventure, with a stunning Mediterranean coastal singing holiday aboard a luxury wooden ‘Gulet’ which was fantastic fun and we shall be doing that again! Click here to find out more. Past work includes inventing creative voice play and singing programmes for children and adults with special needs, and those with depression or mental health issues as well as university drama students. For 5 years (until Feb 2017) she also ran Cardiff’s only ‘Singing for the Brain’ sessions for people with dementia and their carers. She is currently hoping to cram in some more time for performing opportunities, having spent 5 years till 2016, as a performer and a member of the sassy ‘Fanfare of Strumpets‘, a talented female a cappella group specialising in the singing of eclectic repertoire and the wearing of fabulous frocks..